My attraction to Mardi Gras is directly tied to my attraction to the Gulf Coast. Growing up inland, Mardi Gras always seemed mysterious and somehow “foreign” and like a place I’d rather be. I would see news reports of the activities in New Orleans and Mobile and other celebrations on a smaller scale along the Gulf and they seemed to be in stark contrast to the grey late-winter life around me. I was raised in the Southern Baptist church and we did not observe Ash Wednesday. When I realized the Christian tie-in to the revelry of Mardi Gras and better understood the season that begins on Epiphany and ends precisely at midnight on Shrove Tuesday, that knowledge gave the events of the season even more mystery and appeal. Age, experience, and knowledge began to de-mystify the events of the carnival season leading up to Mardi Gras and more and more the events began to move farther inland. 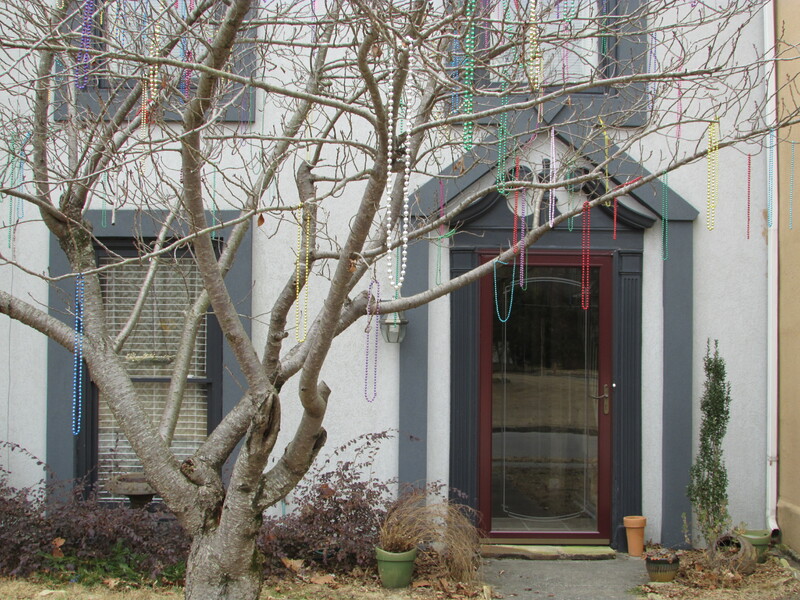 When I was living and teaching in Indiana in the 90s, I began to throw beads at the end of my Fat Tuesday classes to give myself a sense of connection to my home region. Huntsville, where I live now, had its 2nd annual Mardi Gras parade on Saturday, February 14, but it’s a sad substitute for the real deal on the coast. I am a bit of a traditionalist and a purist when it comes to the proper way to do things and I bristle a bit at the fact that one can now stand beneath a New Orleans Bourbon Street balcony and be showered with Mardi Gras beads on virtually any night of the year. In my mind, Mardi Gras beads should only be thrown in the season. And then they should be packed away until the following January. 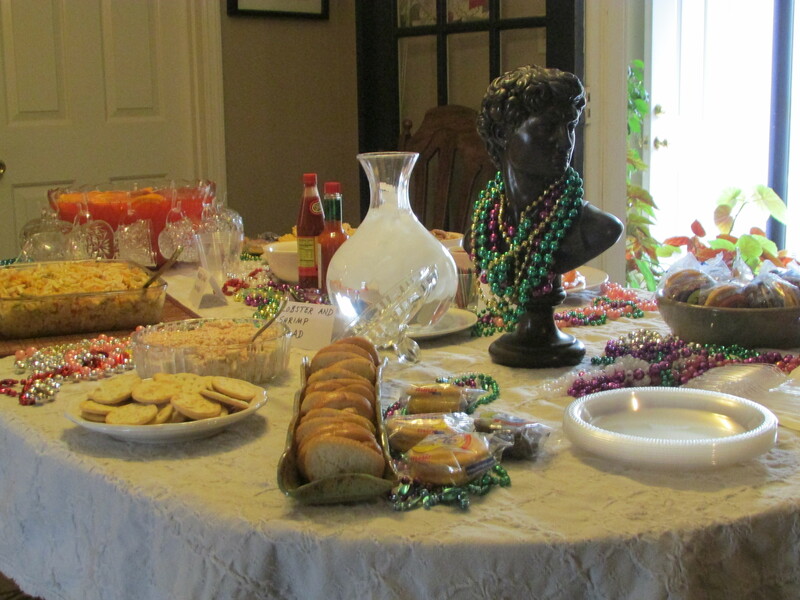 The appeal of tradition and the desire to recapture the mystique of “The Season” on the Gulf Coast of the Deep South is one of the reasons Joe Cain Day, observed in Mobile on the Sunday preceding Fat Tuesday (and the subject of my previous essay), has engaged me. I hosted my first Joe Cain Day celebration this Sunday, February 15, and it brought some levity to a blustery February afternoon in north Alabama as still another cold front – “the weather of northern aggression” I call it – moved into the area. On the invitations I wrote “Masks and mourning attire optional.” My guests, some of them wearing masks and almost all dressed in some form of black in “mourning” for Joe Cain, enjoyed the respite before the cold and icy work week resumed. I designed the menu to reflect regional and seasonal tastes and as usual there was much more food than was needed. I made a lot of the food myself. I purchased other things from favorite vendors. Here’s my menu. The gumbo was ordered from Wintzell’s (www.wintzellsoysterhouse.com), a Mobile-based oyster house and restaurant that makes one of my favorite gumbos. 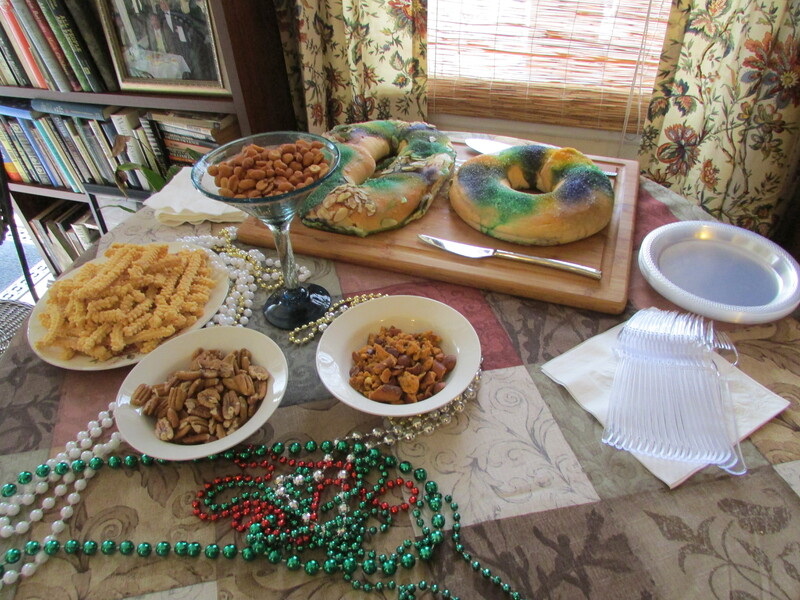 The King Cake, a carnival season standard, came from Paul’s Pastry Shop (www.paulspastry.com) in Picayune, Mississippi. My friends G. Todd and Anita brought a couple of other dishes — a crawfish beignet with a savory sauce and crostini topped with shrimp, red pepper jelly, and sweet potato. The chocolates were from the Chocolate Gallery in Huntsville (www.chocolategalleryal.com). 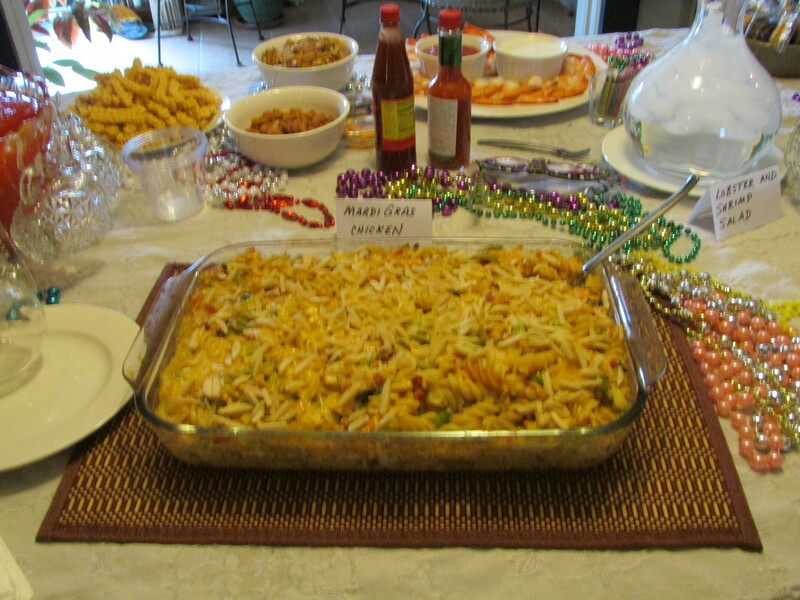 I made my own revisions to the recipe and my adaptation of Mrs. Brunson’s adaptation is what I’m offering here. It’s a hit. Cook rotelli pasta in chicken broth. Since it will be baked in a casserole, it is best to cook it until it is fairly limp. Drain pasta. Add chicken to pasta (chop chicken into fairly large bites). Add peppers, onion, celery, and pimento. Stir in cream of mushroom soup, sour cream, and ½ cup cheese. Place mixture in large casserole dish and top with ½ cup cheese and minced almonds. Bake at 350 degrees for I hour. This entry was posted in food, Joe Cain Day, Mardi Gras, travel and tagged Alabama, Carnival Season, culture, food, Jean Brunson, Joe Cain Day, King Cake, Mardi Gras, Mardi Gras Chicken, Mobile, Paul's Pastry Shop, recipes, Southern Foodways Alliance, the south, travel, Wintzell's on February 17, 2015 by gedwardjourney.